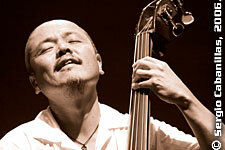 Bassist Kiyoshi Kitagawa is one of the select Japanese jazz musicians who are "in demand" in the competitive New York scene. After paying his dues in Japan, Kitagawa went to New York in 1988 all by himself. Since then, he has performed or recorded with many prominent artists such as Kenny Garrett, Jimmy Heath, Terell Stafford, Kenny Barron, Andy Bey and Jon Faddis. With his deep and fat tone and impeccable rhythm, Kitagawa is a trusted member of the Kenny Barron's and Andy Bey's regular band. He is prominently featured in Bey's 2003 hit CD American Song and Barron's Images. He is currently signed with Japanese independent label Atelier Sawano, which have released his two superb leader albums with Barron and amazing drummer Brian Blade.